Background: Even after decades of research in the field of gliomas, the overall prognosis is still quite dismal. Several factors have been proposed that affect the outcome and survival length of patients with a glioma. Here, we present a series of 471 patients, who underwent surgical resection of their glioma at a tertiary level neurosurgical centre. Materials and Methods: We noted retrospective data of patients' age, histological tumor grade, and whether or not intraoperative magnetic resonance imaging (MRI) was used, and assessed the survival length of these patients from the day of surgery. Results: The overall survival in our series was approximately 14 months. Predictably, those with age less than 40 years and those with Karnofsky performance score (KPS) ≥80 had longer survival than those with a higher age and KPS <80; those with World Health Organisation (WHO) grade IV lesions had the shortest survival length compared to all the other grades. However, while comparing survival among other tumor grades, we did not find significant difference. Further, use of intraoperative MRI did not offer any statistically significant difference in survival. Conclusion: In addition to the conventional prognostic factors we need more definate ways to accurately predict survival in patients harbouring a glioma. Probably, assessing molecular characteristics of the individual tumors, such as presence of isocitrate dehydrogenase (IDH) mutation versus wild-type IDH, would help us in predicting survival more accurately. Gliomas comprise a heterogeneous group of tumors of the central nervous system. They include different histopathological types such as astrocytoma, oligodendroglioma, oligoastrocytoma (or mixed glioma), and ependymoma, and are graded from grade I to IV as per the World Health Organization (WHO) classification of central nervous system tumors. Achieving complete cure of malignant gliomas has been the Holy Grail of neurosurgeons across the world. Significant improvements in treatment strategies have led to better outcome in low-grade gliomas; unfortunately, the same cannot be said about the high-grade ones. Despite several improvised strategies and technological advancements, the prognosis of high grade gliomas (WHO grades III and IV) remains dismal. However, several factors have been found to influence the final outcome and survival of the patients, e.g., greater extent of resection leads to longer survival of patients.,,,, Low-grade gliomas (WHO grades I and II) have a better outcome; however, they pose a different set of problems, such as the development of epilepsy and cognitive decline, and most importantly, they have a significant risk of malignant transformation over a course of time. Here, we present our experience in treating intracranial gliomas over a period of 5 years at a tertiary level neurosurgical centre. This study is a retrospective analysis wherein we included all patients who were admitted at our hospital, from January 2010 till December 2014, with an intracranial glioma (astrocytoma, oligodendroglioma, oligoastrocytoma, ependymoma, WHO grades I to IV) and underwent surgical resection. Those who had other life-threatening comorbidities were excluded from this study. Further, those who underwent only biopsy of the tumor and not resection were also excluded. In addition, patients who subsequently expired from unrelated causes were also excluded. Patients' demographic features, pre- and postoperative clinical status, Karnofsky performance score (KPS), radiological images, and postoperative length of survival were noted. The length of survival was calculated from the day of surgery till the last date of contact (outpatient department [OPD] visit or telephonic communication) or the reported date of death. For all the surgical procedures, we used OPMI Pentero microscope, which had provision for blue-light setting at 400–410 nm (Carl Zeiss, Oberkochen Germany). For patients with a prefrontal tumor, a frontal craniotomy and lobectomy was done. For a posterior frontal lobar tumor, frontoparietal craniotomy with lesionectomy was done trying to preserve the motor strip. For a temporal lobe tumor, temoral craniotomy and resection of the lesion was done; temporal lobectomy was performed if lesion was more towards the anterior temporal lobe. Similarly, for a parietal and occipital lobar tumor, respectively, parietal and occipital craniotomies were conducted with resection of the lesion, with due effort made to preserve the eloquent areas. More limited and tailored resection was carried out if the lesion was in the dominant hemisphere. For a bifrontal lesion, bifrontal or unilateral craniotomy was done, depending on the extent of the lesion. In patients who had an intraoperative MRI done, we used the Brain Suite (BRAIN LAB) with 1.5 tesla SIEMENS MRI with an integrated MR-guided navigation system. In such patients, during surgery when the surgeon was satisfied that all apparent tumor tissue has been resected, an intraoperative MRI was done, and if it revealed any residual lesion, then re-exploration and further resection was done. Otherwise, if no residual lesion was seen, then the surgery was concluded. In 47 patients (WHO grades III and IV), we used 5-aminolevulinic acid dye. In these patients, the dye was administered orally under supervision in a dosage of 20mg/kg body weight, 4 hours prior to the induction of anesthesia. The surgical resection was done by our inhouse neurosurgeons who are highly trained in glioma surgery and well-accustomed with the use of intraoperative MRI and 5-ALA dye. The histopathological analysis of the tissue samples was done by our neuropathologist and the tumors were graded according to the WHO 2007 classification of brain tumors. All the tissue slides of the tumors with glial component were tested for glial fibrillary acidic protein (GFAP). However, chromosome 1p/19q codeletion, IDH (isocitrate dehydrogenase) mutation, or MGMT (methyl-guanine methyl transferase) methylation status were not routinely performed. All patients with grade II, III, and IV gliomas were referred for postoperative external beam radiotherapy with concomitant temozolamide therapy followed by adjuvant temozolamide therapy. Only a few patients who expired within a month or so after the surgery did not receive any post-operative chemoradiation. In all the surviving patients, postoperative follow-up contrast-enhanced MRI was done after 3 months and periodically thereafter. Patients were being followed up on an OPD basis at regular intervals, and those who did not turn up in the OPD were contacted over telephone. The follow-up information was taken until January, 2016. Data was retrieved retrospectively from electronic hospital informatics system (eHIS) and analyzed with the Statistical Package for the Social Sciences software (SPSS Inc. 1968), version 24.0; P < 0.05 was considered to be statistically significant. A total of 471 patients were included in this series. 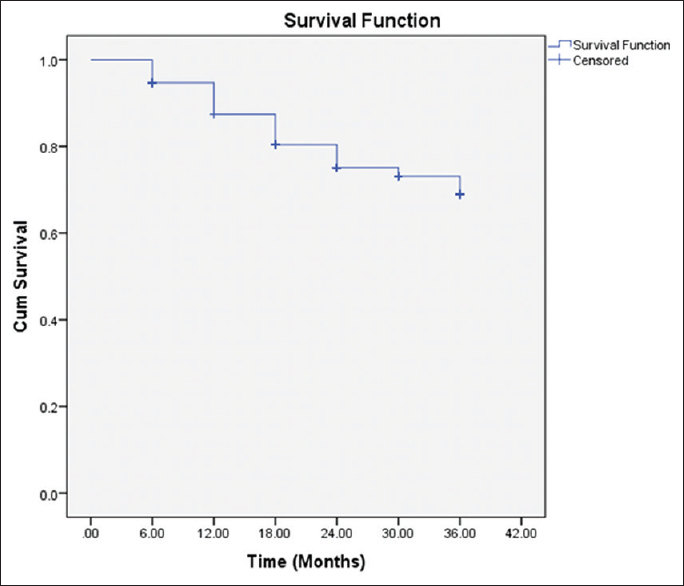 The overall minimum postoperative survival was 1 day, and the maximum survival was 62 months (mean 14 months and median 11.5 months) [Table 1]. Out of the total 471 patients, 79 had been confirmed to have expired during follow-up, and another 258 patients have been lost to follow-up. For these 258 patients, we presumed the worst possible scenario and considered them to have died during follow-up; we have considered their postoperative length of survival till their last contact with us. We analyzed the overall survival of the patients in different time intervals from the date of the surgery and found that 28.5% of the patients expired within the first 6 months after surgery and 8.9% patients survived beyond 2.5 years [Table 2]. 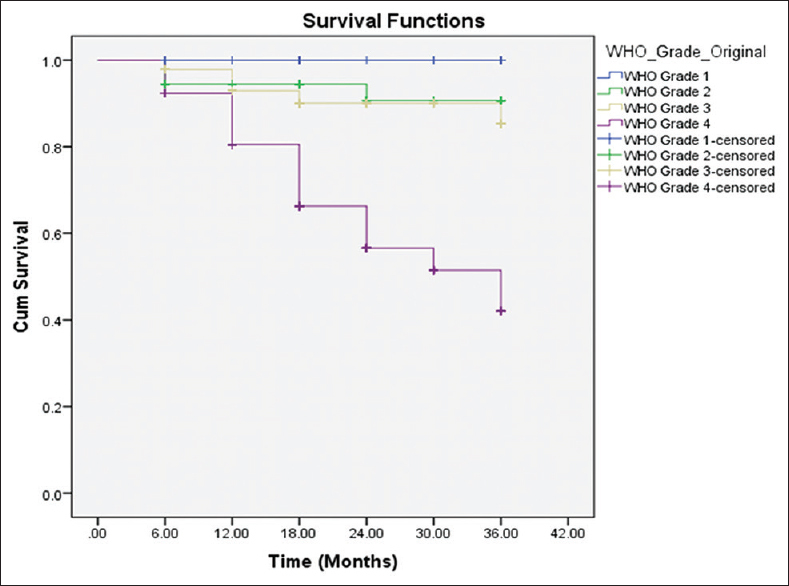 The overall survival probability of the patients of glioma, irrespective of tumor grade and other clinicoradiological factors, has been plotted in [Figure 1]. We analyzed all the glioma patients in two different age groups – more than and less than 40 years. There were 172 patients less than 40 years of age. Mean survival in these patients was 496.6 days or approximately 16.5 months (range 1–1860 days, i.e. 42 months). [Table 3] depicts the survival trend in these patients. There were 297 patients more than 40 years of age. Among these patients, mean survival was 376.4 days or approximately 12.5 months (range: 1–1710 days, i.e. 57 months). 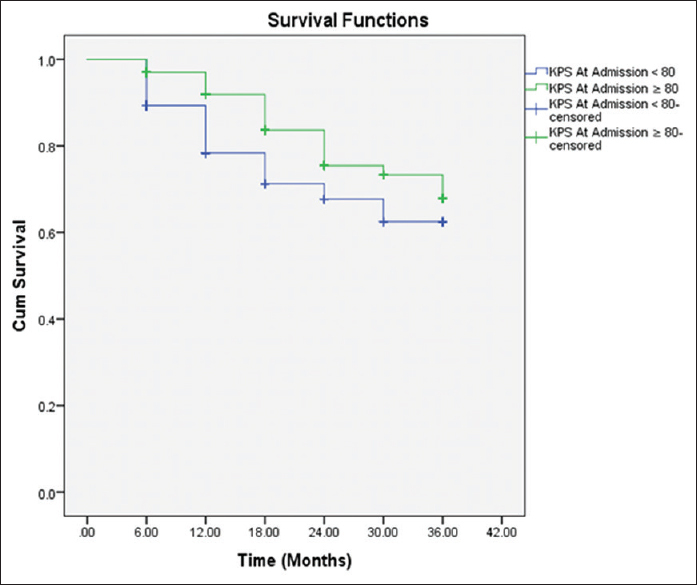 [Table 4] shows the percentage of surviving patients in this subgroup at different time lengths. On comparing the two age groups, we found a distinct survival advantage in those patients who were less than 40 years of age (P = 0.0001) [Figure 2]. We then compared the preoperative KPS of the patients on admission [Figure 3]. We could retrieve data of 424 patients with respect to KPS, and found that 284 patients had preoperative KPS more than or equal to 80. Their mean postoperative survival was 31.27 months (standard error: 0.81). One hundred and forty patients had preoperative KPS of less than 80 and their mean survival was 28.14 months (standard error: 1.40). Those with KPS more than or equal to 80 had longer survival (P = 0.03). Thus, it is evident that preoperative KPS is an important factor in predicting postoperative prognosis and length of survival. Further, we compared the impact of laterality of the tumor on overall survival [Figure 4]. There were 201 patients who had purely right-sided lesion and 219 patients who had purely left-sided lesion. Rest of the 51 patients had midline location of the lesion or had bilateral involvement. Among those with a right-sided lesion, the mean length of survival after surgery was 413.5 days (range: 1–1770 days). In those with a left-sided lesion, the mean survival was 421.6 days (range: 1–1860 days). There was no significant variation in the length of survival between the two groups. Among the 201 patients with right-sided lesions, 70 had right frontal, 66 had right temporal, 47 had right parietal, and 18 had right occipital lobar lesions. Among the 219 patients with left-sided lesions, 95 had left frontal, 57 had left temporal, 52 had left parietal, and 15 had left occipital lobar lesions. Rest of the 51 patients had midline or bilateral involvement, such as callosal or butterfly glioma. Intraoperative MRI was done in 76 patients. The mean survival length in these patients was 295.3 days (range: 1–1170 days). 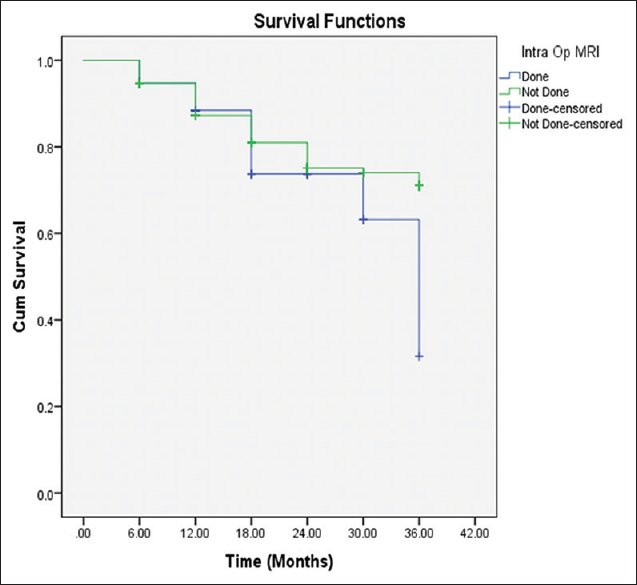 No intraoperative MRI was done for the remaining 395 patients, who had mean survival of 444.5 (range: 1–1860 days). 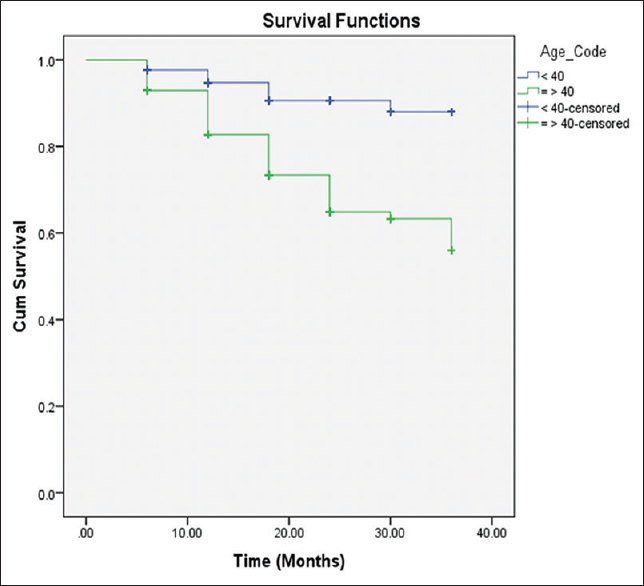 There was no significant difference in survival between these two groups (P = 0.49) [Table 5] and [Figure 5]. Sixty-seven patients expired within a month of the surgery. These patients did not receive any postoperative chemoradiotherapy. Out of them, 3 had WHO grade I glioma, 7 had WHO grade 2 glioma, 18 had WHO grade III glioma, and an overwhelming number of 39 patients had WHO grade IV glioma. [Table 6] describes the impact of different variables on the survival of patients. Tumor grade and age of the patient had a definitive role in determining survival. Over the years, significant progress has been made in the treatment strategies for gliomas. Previously, most of the glioma patients were treated with surgery as well as radiotherapy, and occasionally with surgery or radiotherapy alone. From around the middle of the last decade, chemotherapy was added as an integral part of the multimodality treatment regimen. Several new tools have been added to the armamentarium of neurosurgeons such as an intraoperative MRI and the use of ALA fluorescence. All these factors have helped in improving the outcome of treatment. Nevertheless, the overall picture is grim. In this study, we present data, collected at a single tertiary care centre over a period of 5 years. We included a total of 471 patients. The mean survival in our series was 14.01 months, ranging from 1 day to 5 years. However, the actual survival lengths probably will be higher because we calculated length of survival till the last OPD visit, or telephonic contact, or the reported date of death, whereas actually at least a proportion of them may still be surviving. In 47 patients with WHO grades III and IV gliomas, we used amino-levulinic acid (ALA)-induced fluorescence-guided resection of the tumors. In high-grade gliomas, especially the contrast-enhancing lesions, ALA-induced fluorescence guided resection helps in achieving a greater extent of resection of the tumors, which in turn translates into longer survival of the patients. Several authors , have shown that preoperative KPS is an important variable which predicts the outcome in cases of low-grade as well as high-grade glioma. Especially, preoperative KPS of less than 80 has been marked as a high risk factor with these patients having a shorter postoperative survival. In our series as well, we have found that those patients with preoperative KPS of less than 80 had statistically significant shorter survival compared to those with KPS equal to or more than 80. Tait et al., have shown that right-sided location of the tumor usually favors longer survival. However, in our series, we have found no significant difference in the length of survival depending on the laterality of the lesion. Senft et al., have shown that the use of intraoperative MRI in glioma surgery aids in optimal resection of the tumor. As it is well-known that a greater extent of resection of the tumor translates into longer survival, it has been shown by several authors , that the use of intraoperative MRI is usually associated with better survival outcome. Intraoperative imaging allows the neurosurgeon to achieve gross total or near total excision of tumor, without damaging the vital structures of the brain. This leads to lesser postoperative morbidity, and by minimizing the tumor load, the length of survival is prolonged. However, in our study we found that there is no statistically significant difference in the survival length of the patients with or without use of intraoperative MRI. Recently, the optimal use of navigable ultrasound during surgery has been shown to achieve greater resection of tumor, with less damage to eloquent brain areas, thereby prolonging the survival of patients. As expected, the majority of patients in our series harbored a glioblastoma multiforme (WHO grade IV). This conforms with several other studies reporting on the incidence of several types of glioma. Patients with high grade (grades III and IV) lesions had a shorter survival compared to those with low grade (grades I and II) lesions. Those with grade IV lesions had the worst prognosis compared to each of the other grades. Several large study series ,, have demonstrated poor outcome of high-grade (WHO grades III and IV) tumors over the low-grade ones (WHO grades I and II), with glioblastoma multiforme (WHO grade IV) having the worst prognosis. In perhaps the largest series  from China (which included 1285 glioma patients), it has been shown that in patients with a low-grade glioma, age, preoperative KPS, pathological type, radiotherapy, O (6)-methylguanine-DNA methyltransferase (MGMT) expression, and Ki-67 expression were significantly associated with overall survival, and preoperative KPS and radiotherapy were significantly associated with progression-free survival. For anaplastic gliomas, age, preoperative KPS, pathological type, extent of resection, radiotherapy, p53 expression, and phosphatase and tensin homolog (PTEN) expression were associated with overall survival. For glioblastomas, age, preoperative KPS, pathology type, extent of resection, radiotherapy, and chemotherapy were associated with overall survival and age, gender, preoperative KPS, extent of resection, radiotherapy and chemotherapy were associated with progression free survival. Immunohistochemistry has emerged as a significant tool in the field of glioma management. Immunohistochemical markers are being utilized for diagnosis as well as for prognostication purposes. The markers used for the diagnosis of glioma are GFAP and S-100. The markers used for prognostication are MIB-1, Ki-67, p53 tumor suppressor gene, retinoblastoma (Rb) tumor suppressor gene, epidermal growth factor receptor (EGFR) gene, IDH 1 and 2, and ATRX gene. However, correlation between clinical, radiological, and morphological parameters is mandatory. It is noteworthy to mention that most antigens are not restricted to a single type of tumor, and the amount of antigen present in a tumor is also variable. Further, when multiple immunohistochemical markers are used, which is often the case, the cost burden also mounts. A significant new development in the field of glioma management has been the latest 2016 WHO classification of brain tumors.,,, This has resulted in a paradigm shift in understanding the prognosis of the different grades of glioma. Significant weightage has been given to molecular characteristics of the tumors based on immunohistochemistry. For example, the presence of IDH1 and 2 mutation changes the prognosis by predicting a better outcome and longer survival, as compared to another patient with a same grade tumor but with wild type of IDH gene. Further, the diagnosis of oligodendroglioma (which carries a better prognosis) requires the compulsory presence of IDH mutation along with chromosome 1p/19q codeletion. An astrocytic tumor morphology is compatible with the diagnosis of oligodendroglioma when molecular testing reveals the entity-defining combination of IDH mutation and chromosome 1p/19q codeletion. On the other hand, a diffusely infiltrating WHO grade II glioma, with classic oligodendroglial histology, for which molecular testing for combined IDH mutation and chromosome 1p/19q codeletion could not be fully performed or remained inconclusive, is to be termed as oligodendroglioma NOS. Thus, among the IDH-mutant gliomas, 30–40% cases show chromosome 1p/19q codeletion, and among the remaining, 94% show p53 and alpha thalassemia/mental retardation syndrome X-linked (ATRX) mutations. These alterations are increasingly being used for oligodendrogliomas and astrocytomas, respectively. Most primary GBMs are IDH-wild type and most secondary GBMs are IDH-mutated ones, with ATRX inactivation. Epithelial cell transformation sequence 2 (ETC2) gene expression level has been found to be higher in WHO grade IV gliomas compared to low-grade gliomas and nonglioma controls. Its overexpression is associated with shorter survival of the patients. ETC2 has also been considered as a potential therapeutic candidate in the treatment of high grade gliomas. To summarize, the diagnosis of gliomas so far has been based on the premises of histological features. With recent developments in immunohistochemistry, more and more molecular markers are being used to correctly diagnose the type of glioma (e.g., astrocytoma vs. oligodendroglioma) and to have better prognostication predictive value. This new 2016 WHO classification does not change the broad gradation of the gliomas, as we know from the 2007 WHO classification. However, within individuals grades, different patients may have different outcomes, depending on the molecular characteristics of the tumors. This new classification helps us in predicting the prognosis of the different gliomas in a better and more comprehensive manner. Till now, there was no explanation of the different outcomes of patients with similar grade tumors. As we see from this classification, even within the same grade, different patients with different molecular traits, will have different outcomes. In our series, we have found that the use of intraoperative MRI did not necessarily extend the survival of the patients. Further, only patients with grade IV lesions had statistically significant worse outcome (in terms of shorter survival) than those with other grade lesions. All these could be explained by the lack of molecular testing among patients in our series, which, if done, could have allowed us to segregate patients with different probabilities of outcome more accurately. The 2016 WHO classification of brain tumors opens up a whole new way of dealing with gliomas and in predicting their outcomes. In our fairly large series, we have tried to show the general trend of survival at our centre, as well as the impact of the patients' age, laterality of the lesion, preoperative KPS, tumor histological grade, and the use of intraoperative MRI. In future, with the routine use of immunohistochemical analysis of the molecular characteristics of each glioma patient, we shall be in a much better position to predict the outcome and survival of patients with gliomas. Simpson JR, Horton J, Scott C, Curran WJ, Rubin P, Fischbach J, et al. Influence of location and extent of surgical resection on survival of patients with glioblastoma multiforme: Results of three consecutive Radiation Therapy Oncology Group (RTOG) clinical trials. Int J Radiat Oncol Biol Phys 1993;26:239-44. Lacroix M, Abi-Said D, Fourney DR, Gokaslan ZL, Shi W, DeMonte F, et al. A multivariate analysis of 416 patients with glioblastoma multiforme: Prognosis, extent of resection, and survival. J Neurosurg 2001;95:190-8. Carapella CM, Telera S, Oppido PA. Surgery of malignant gliomas: Advances and perspectives. Curr Opin Oncol 2011;23:624-9. Stummer W, Reulen HJ, Meinel T, Pichlmeier U, Schumacher W, Tonn JC, et al. Extent of resection and survival in glioblastoma multiforme: Identification of and adjustment for bias. Neurosurgery 2008;62:564-76. Whittle IR. The dilemma of low grade glioma. J Neurol Neurosurg Psychiatry 2004;75(Suppl. 2):ii31-6. Ho VKY, Reijneveld JC, Enting RH, Bienfait HP, Robe P, Baumert BG, Visser O. Changing incidence and improved survival of gliomas. Eur J Cancer 2014;50:2309-18. Curran WJ, Scott CB, Horton J, Nelson JS, Weinstein AS, Fischbach AJ, et al. Recursive partitioning analysis of prognostic factors in three Radiation Therapy Oncology Group malignant glioma Trials. J Natl Cancer Inst 1993;85:704-10. Stenning SP, Freedman LS, Bleehen NM. Prognostic factors for high-grade malignant glioma: Development of a prognostic index. A report of the Medical Research Council brain tumour working party. J Neurooncol 1990;9:47-55. Tait MJ, Petrik V, Loosemore A, Bell BA, Papadopoulos MC. Survival of patients with glioblastoma multiforme has not improved between 1993 and 2004: Analysis of 625 cases. Br J Neurosurg 2007;21:496-500. Napolitano M, Vaz G, Lawson TM, Docquier MA, van Maanen A, Duprez T, et al. Glioblastoma surgery with and without intraoperative MRI at 3.0T. Neurochirurgie 2014;60:143-50. Cabrera HN, Almeida AN, Silva CC, Fonoff ET, Martin Md, Leite Cda C, et al. Use of intraoperative MRI for resection of gliomas. Arq Neuropsiquiatr 2011;69:949-53. Ohgaki H, Kleihues P. Population-based studies on incidence, survival rates, and genetic alterations in astrocytic and oligodendroglial gliomas. J Neuropathol Exp Neurol 2005;64:479-89. Yang P, Wang Y, Peng X, You G, Zhang W, Yan W, et al. Management and survival rates in patients with glioma in China (2004-2010): A retrospective study from a single-institution. J Neurooncol 2013;113:259-66. Louis DN, Perry A, Reifenberger G, von Deimling A, Figarella-Branger D, Cavenee WK, et al. The 2016 World Health Organisation classification of tumours of the central nervous system: A summary. Acta Neropathol 2016;131:803-20. Jaiswal S. Role of immunohistochemistry in the diagnosis of central nervous system tumours. Neurol India 2016;64:502-12. Moiyadi AV, Stummer W. Aminolevulinic acid-induced fluorescence-guided resection of brain tumour. Neurol India 2015;63:155-65. 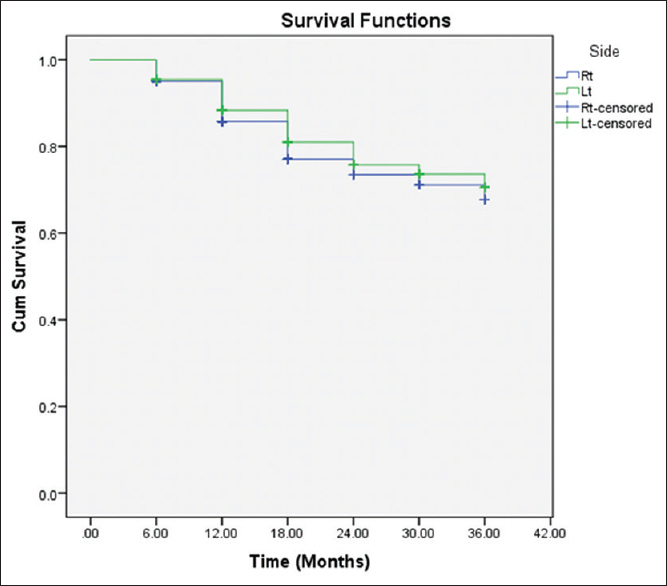 Moiyadi AV, Kannan S, Shetty P. Navigated intra-operative ultrasound for resection of glioma: Predictive value, influence on resection and survival. Neurol India 2015;63:727-35. Chacko G. Epidermal growth factor gene amplification in high grade gliomas. Neurol India 2016;64:25-6. Cheng YS, Lin C, Cheng YP, Yu YL, Tang CT, Hueng DY. Epithelial cell transformation sequence 2 is a potential biomarker of unfavorable survival in human gliomas. Neurol India 2014;62:406-9. Lamborn KR, Chang SM, Prades MD. Prognostic factors for survival of patients with GBM: Recursive partitioning analysis. Neuro Oncol. 2004;6(3):227-235. Bauman G, Fisher B, Watling C, Cairncross JG, Macdonald D. Adult supratentorial low grade glioma: Long term experience at a single institution. Int J Radiat Oncol Biol Phys 2009;75:1401-7.